Michael Sweet is a Canadian writer and photographer. He lives in New York City. I recently stumbled into a Facebook conversation about Leica and how great they are. 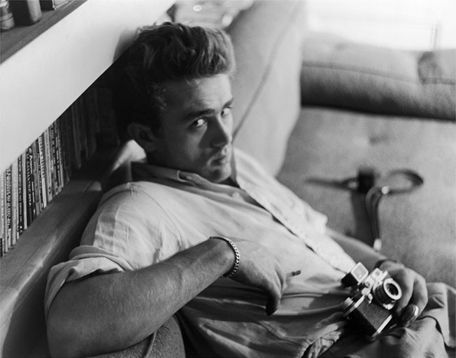 How perfect the photographs from a Leica camera are etc. You know how this goes, right? We’ve all seen these rants. Well, here is a counter rant. Leica is a good camera, perhaps even a really good camera, but certainly nothing like it’s mythologized status. After my recent article, Street Photography Has No Clothes, I figured I might as well tackle another controversial issue in the world of photography, and street photography more particularly – “Leica liking” and the mythology that surrounds it. So here goes, for better or for worse. Mostly worse, I expect. Keep in mind that writers present a point of view, an opinion, and good writers do this unapologetically. It doesn’t, however, mean that my opinion is not open to debate. Leica is a luxury brand (and arguably a camera company) which manufactures very good, but certainly not perfect or “best in existence” cameras. What they are truly good at, these days, is cashing in on the Leica myth – that if you own a Leica you have arrived as a photographer. This works nicely these days with everyone aspiring to be some form of “photographer”. Leica was the best. It was. In the analog era, Leica had it nailed because they figured out how to make a camera body (a mechanical thing in those days) that would not wear out. Try it. 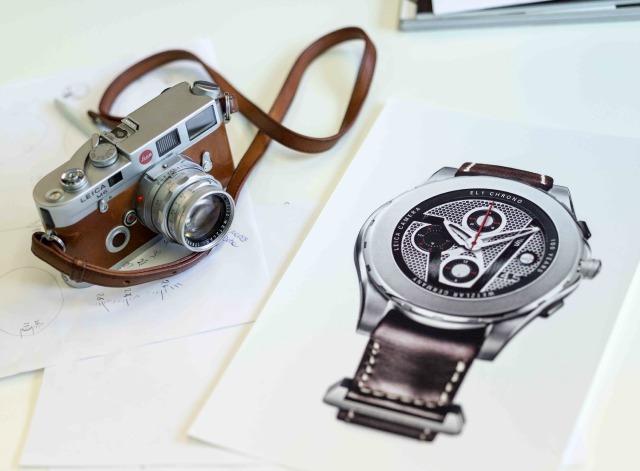 You can’t wear out a Leica M if you try. This was a huge plus in the era of the Nikon F, which one could easily wear out with heavy use. So Leica made a name (a history, a myth) for itself by building a great camera body and adding (let us not forget) amazing glass. Now, considering how many people, especially street photographers, shoot these analog cameras, one would be hard pressed to tell the resulting photographs apart – Nikon F versus Leica M. I mean how much definition do you really get when you zone focus and push Tri-X two stops! Besides, who’s making gallery-sized prints of street photography anyway? Furthermore, this analog-era argument for Leica superiority doesn’t hold up anymore, despite Leica’s best efforts to keep it alive. How well-built do you really need your digital camera? Won’t it out date itself in five years (ten at the very most) anyway? But those lenses you say, don’t forget those great Leica lenses. Okay, Leica makes great lenses, pop one on a Sony and save yourself five grand. And, get using the lens in a way that you can actually tell the difference. If I made a website where you could go and look at photographs made with Leica glass and photographs made with say Sony glass, you’d be scratching your head to tell the difference. Especially given how the vast majority of users use these lenses. Okay, maybe you could tell the difference, because I don’t want to get into an argument with you, but most people could not. Someone should set up this experiment and give it a go. I digress. Back to the story here. So in this Facebook chat someone is trying to convince me that Leica cameras represent photographic perfection. They make better photographs than a Canon or a Fuji, or an Olympus or a Sony. Hard argument at the best of times. I offered a little resistance and then the conversation changed to: Well, I can make comparable photographs with my Sony or Nikon, but ask me which camera inspires me to shoot, which camera I love to hold and use – it’s hands down Leica. Fair enough. You like the feel of a Leica. I can buy that, they are still very well made cameras which provide a luxury tactile experience. It doesn’t hurt to also know in the back of your mind that your holding onto 10K. I don’t mind the “I like a Leica” argument. Everyone is entitled to like what they want and to spend their money as they see fit. But get the argument straight. Stop trying to sell Leica as the best performing camera ever made because you look silly. No one believes you, not even Leica. I know what’s going on in your mind, I’ve been there. When I began in photography I dreamed of owning a Leica. I lived and breathed Leica – all the greats had one, or so I thought at the time. Finally, after many years, I got one…then another and another. I’ve owned four or five now, both digital and analog. M6, M9, X, X2, and some re-branded Panasonic models. All have been less than impressive for me, personally. They are big, heavy, draw attention and are expensive. Do they take good photographs, likely, when used properly by a competent user. Are they the best cameras on earth? Not a chance. Most expensive, maybe. Most luxurious, likely. Once again, we see praise or hate being dished up in the photography world not based on facts and objective opinion, but rather passion, emotion, and “mob mentality”. Leica provides an experience and a name and a legacy. This is what people are buying into. It’s like a nice watch. My Rolex is beautiful and feels nice and tells the world I have money and appreciate fine watches. Does it tell time better than my Swatch? No. In fact, well, you know the rest. If I were to go around trying to convince people that I were a better time keeper because I’m wearing a Rolex I’d be laughed out of the room. So what’s the difference? Yes, I know, just opened a door for the Leica likers to try every possible tactic they can to tear this argument to shreds. Go at it. Before you write and tell me to “bugger off”, or that I am “jealous of better photographers than me” and a bunch of other stuff your mother raised you not to say out loud, think it over. Do you really believe, in the truest place within yourself, that you are making superior photographs because you are using a Leica… or is there just some small part of you that is longing to own a piece of that great legend that is Leica? Oh, and if you’d be so kind as to attack the argument, rather than me, as this is not, I repeat, NOT, aimed at any individual …. it’s aimed at a phenomenon… a “thing” I see out in the world of photography. Please, do not take this rant personally. So, was there a time when the “Leica is better” argument could have held water? Yes, but it doesn’t hold up well anymore. Leica runs a marketing machine to beat out the others, who make perfectly equivalent digital cameras. Often better cameras. For example, the Leica X didn’t impress me at all. Slow, fussy, and your choice of a $500 ugly hump of a viewfinder or a $300 useless brightline finder. Same or better photographs from a Sony RX100 and far superior user experience with nearly 2G in savings. How technically “perfect” does an image need to be, anyway? Where, or rather when, should I focus shift away from technical perfection and gear to content and composition? Not convinced? Go out into the Leica wilderness and see some of these arguments for yourself. It’s great comedy. You can easily find someone with a re-branded Panasonic telling you not only that it takes better pictures than any other camera, but also not knowing that they are holding a Panasonic and not a Leica. It’s great stuff. Then there are those that have the cheapest German made Leica they could get their hands on telling us how great the camera is because it’s not a Panasonic. Seriously? This post will get both positive and negative reactions, which helps prove my point. If I were arguing the difference between say, a Ricoh GR and a Sony RX100, this article would die a quick death. But where Leica is concerned there is fire. It’s almost taboo to critique a Leica product and this alone should raise a few eyebrows. Leica likers cannot be reasoned with. They run on faith, an almost religious faith. It’s like trying to rationalize the non-existence of god to a Christian. And, I guess that’s okay. I just wish a few more photographers out there would fess up and admit that we buy a Leica because they are an expensive, cool, luxury status symbol that you have finally arrived in the world of photography, or that you simply have money to burn – like my Rolex (which I don’t own, for the record) – or that you are trying to get just a little closer to Winogrand’s ghost. It’s okay to buy into an idea, a culture, we all do it. But if you’re going to lay out 10 large for a camera, just know what you’re really buying, and it ain’t better photographs. What some people seem to have missed is that the great photographers were great photographers, and they happened to use a Leica. Not that the great photographers were great photographers because they used a Leica. Person 1: So, are you saying I should buy a Leica? That it will make me look cool? 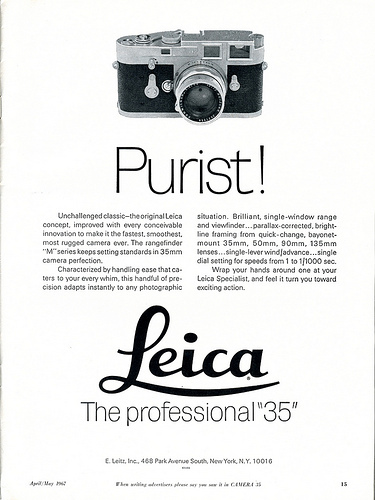 This entry was posted in Famous Leica Users, Leica, Leica Advertisements on August 11, 2015 by Leicaphila.